The Barber Vintage Festival, near Birmingham, Alabama, now in its 11th year is America's largest, most complete vintage motorcycle experience. 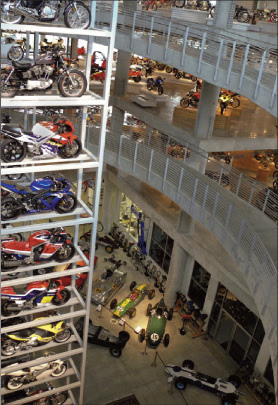 When you attend you can take in the largest motorcycle museum in the world*, see on track vintage racing sanctioned by AHRMA, enjoy the Century Race for 100 year old motorcycles, take in the Swap Meet and the J Wood Auctions motorcycle sale. Stop by the National Motorcycle Museum display in the Swap Meet and say hello!